In the last few years, hyperconverged infrastructure has become an optimal way to run enterprise cloud. Meanwhile, the cyber threat landscape has worsened, demanding new approaches to protecting from advanced attacks. One of the many advantages of hyperconverged infrastructure is that it can include native data protection and recovery features. However, to gain advanced data protection, users can attach a pre-certified data backup and recovery solution to provide enterprise-grade capabilities such as disaster-recovery-as-a-service (DRaaS), sandboxes built from the latest backups to test software, and automated ransomware detection. •How to protect the hyperconverged infrastructure from ransomware, software incompatibility issues, and lost files. •How the combination of the two solutions can recover critical business applications in the cloud, even in the event of a total data center disaster - guaranteed! 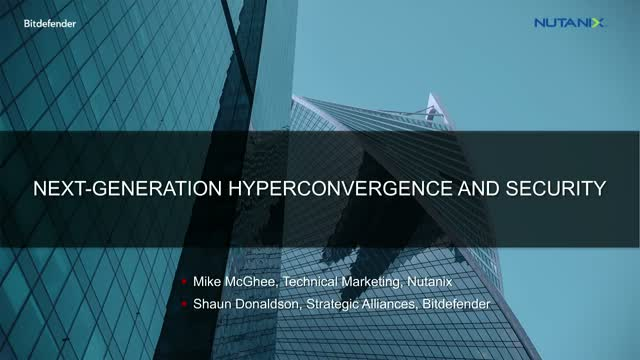 Hyper converged infrastructure (HCI) has completely disrupted the enterprise datacenter by breaking down silos to make management of the entire storage, network and compute stack simple and flexible. A data protection solution purpose built and integrated with HCI will make data protection management easy enough for any generalist to handle yet powerful enough for even the most extreme recovery requirements. Join us for this webinar to hear how a customer has implemented Nutanix AOS and Hycu data protection for an integrated and protected HCI solution. Scaling out your file-based data storage just got easier. Never again do you have to sacrifice protection of an on-premise deployment with a seamless public cloud experience. Your Enterprise Cloud brings a common software layer to eliminate the complexity of deploying and managing separate infrastructures. Join this webinar and learn how to increase capacity dynamically while enhancing the protection and recovery of files and scaling on-demand. Did we mention no overlapping technology? Businesses seek to adopt multi-cloud architecture to foster better agility and enable more rapid innovation. However, the complexity of adopting a variety of services across multiple clouds with varying pricing models leads to lack of cloud interoperability, limited visibility and uncontrolled spend. The result is a combination of business and operational challenges for multi-cloud management. Multi-Cloud Governance - how to drive towards optimal resource consumption across clouds with adequate level of security compliance? Harmonizing Private and Public - How to standardize operations across private & public clouds, driving operational consistency for all applications? Self-service for Any App, Any Cloud – what’s the best path to empowering end-users with one-click self-service that is also cloud agnostic? Hybrid cloud is synonymous with agility, scalability & efficiency. Still not sold? What if you could eliminate complex deployment, streamline disjointed operations, and negate the risk of costly disruptions? Let's talk business continuity across your multi cloud environment. (2) public cloud VPC-style logical networking that is API integrated with Nutanix Prism. This joint solution enables unprecedented operational velocity, network automation at VM speed and end-to-end network visibility & troubleshooting. With Big Switch + Nutanix Enterprise Cloud operating just like a public cloud in terms of economics and operational workflows, customers can now optimize app placement across public and private clouds based on app’s needs for elasticity, cost and performance. The rapid adoption of hyperconverged infrastructure (HCI) solutions have been due to their proven ability to deliver scalability, agility, reduced costs, storage redundancy, and reliability. While these are great benefits, perhaps one of the elements that is garnering the most attention right now is data security. Nutanix certainly knows this and is working hard with Thales eSecurity to protect the confidentiality and integrity of sensitive data through strong encryption of user and application data. When used with Vormetric Data Security Manager (DSM), the combined solution provides FIPS certified robust key management and role separation to meet the most stringent security requirements. In this webinar, we will examine the key elements of the joint solution as well as what may be the best options for your organization. There are already a lot of challenges with IT. But, the explosive growth of data and need to ensure protection has made managing and scaling associated data storage more challenging than ever. Security, compliance and privacy needs as well as public cloud integration add further complexities. How do you address these challenges cost-effectively while also ensuring you meet service level, application and other requirements? The world’s most advanced enterprise data centers rely on Nutanix technology to power their mission-critical workloads at any scale. Sureline minimizes time to production and maximizes return on investment (ROI) for Nutanix users by providing compelling value by addressing the key challenges enterprises have in migrating large and complex systems. Sureline SUREedge delivers compelling value to Nutanix users with our enterprise-level Migration solutions. In this live webinar, learn how you can move from any source to Nutanix – we make the physical server to AHV move easy! Did you know that with Sureline’s SUREedge Migrator you can migrate 100s to 1,000s of VMs? Sureline also provides solutions for moving between data centers or from colos with an appliance approach! The integration between Nutanix and Zenoss enables enterprises to ensure the highest levels of performance and availability for applications and services that power their businesses. Zenoss and Nutanix subject matter experts will discuss and showcase how Nutanix uses Zenoss to monitor their HCI and other critical environments at Nutanix data centers. Zenoss enables IT organizations to eliminate blind spots across hybrid IT environments, predict impacts to critical services, resolve issues faster, and operate at any scale the business requires. The session will include a demonstration of the Zenoss and Nutanix environments working together via the Nutanix ZenPack. Both teams will answer questions about Zenoss, the Nutanix ZenPack integration and future roadmap. Customers need the ability to optimize the placement of applications and data workloads to ensure both performance and availability. These challenges are further complicated when applications, data, and people are spread across multiple storage platforms, data centers, and remote office locations. As a fileserver built for the cloud era, Peer and Nutanix Acropolis File Services (AFS) work in concert to conquer the toughest challenges. Featuring a globally-distributed Active-Active file services fabric, the combined solution seamlessly weaves AFS clusters and existing storage systems together with real-time synchronization and distributed file locking. Data can now be made local to users and applications, ensuring optimal performance, integrity, and high availability. Are you still clinging to old-school virtualization? Time to get with the now, and get to know Nutanix AHV—our native, license-free virtualization solution. This comprehensive introduction to AHV and Prism's integrated virtualization management explains why converging virtualization is key achieving a true enterprise cloud experience. We’ll show how easy it is to switch to AHV with demonstrations of provisioning and managing workloads and overseeing the full virtualization environment via Prism. See all of the enterprise-grade capabilities that make AHV the perfect choice for your applications—and your budget. In this technical session we will cover why Nutanix for your core Oracle databases, best practices for success, and real-world experiences. We’ll look at key details on architecting for performance and availability, and hear a customer’s approach to using Nutanix for Oracle, lessons learned, benefits realized, and use cases. Come for a wealth of information, including migrations from legacy UNIX/Solaris to x86 on Nutanix, and how to optimize your approach for running the applications, like eBusiness Suite, that connect to your databases. Predictable performance that satisfies every user’s need is the nirvana for infrastructure teams, but is often something they struggle to achieve. Attend this technical session to learn from experienced Nutanix performance engineers what it takes to design, implement and optimize your Nutanix Enterprise Cloud to drive maximum application performance. Get details on the latest Nutanix software-driven performance enhancements, including AHV Turbo, RDMA, vNUMA, NVMe, and more, and understand different hardware platform capabilities for running Nutanix software. Gain actionable insights into understanding the performance metrics that accurately predict application success, and how to set the right strategies for testing the performance of your application environment. Driving automation and self-service across private and public clouds is the strategic goal for many CIOs. While many of the fundamental building blocks have long been available, they have been missing a unified, full-stack, orchestration layer that works across multiple cloud environments. In this session, we’ll explain and demonstrate Nutanix Calm, which provides cloud operators with a one-click self-service capability to automate application provisioning and lifecycle management across multiple environments, making the entire IT infrastructure more agile and application-centric. Infrastructure can make or break an end user computing project. Successful Citrix XenDesktop and XenApp deployments require efficient, high performance and scalable IT infrastructure to deliver a great user experience. Join this solutions-oriented session and learn everything you need to build your Citrix VDI environment on Nutanix, including weighing the PVS vs. MCS decision, how to leverage GPU and understanding different node options in your plans. Plus you will hear from a customer leveraging Nutanix AHV to make Citrix deployments simpler, a lot more scalable, and cloud-ready. Anand Jayaraman, Sr. Manager, & Aroosh Sohi, Director, Engineering, Nutanix Jonathan Mosco, Sr. Automation Architect, Corp. Businesses today are seeking to adopt hybrid cloud architecture and boost cloud flexibility to improve their responsiveness, and enable more rapid innovation. However, lack of public cloud consumption visibility and security concerns lead to uncontrolled spend and security vulnerabilities. Learn about Nutanix cloud management capabilities that enable organizations to provision and maintain applications across multi-cloud environments, optimize cloud consumption and centralize governance and security compliance. We will discuss some of the most pressing customer challenges such as public cloud cost visibility, compliance, and application vulnerability management. The modernization of corporate file services at remote offices and branch offices (ROBO) is a priority for enterprises as they embark on digital transformation initiatives. Often these organizations' needs cannot be met by public cloud services due to numerous limitations, including data security and governance concerns, performance/latency issues, and bandwidth constraints. Join us to learn how Nutanix and CTERA partner to deliver secure cloud file storage and collaboration services to the edge of the network, powering greater levels of office productivity and TCO reduction. The hyperconverged solution enables organizations to enjoy dramatic infrastructure consolidation while offering great security and performance. Marjon Otero, Systems Engineer, Matt Slotten, Snr. Mgr, Consulting Services; Rachel Luke, Systems Eng. II, Laser Spine Inst. Welcome to Enterprise Cloud 101! This session will provide an introduction to Nutanix software, architecture, and complete feature set. Nutanix experts will show how Nutanix combines HCI storage, virtualization, software defined networking and compute services into the Enterprise Cloud OS that can run on off-the-shelf x86 servers. See how the Enterprise Cloud OS goes beyond legacy datacenter architectures and prepares your business for the hybrid cloud future. Nutanix makes IT infrastructure invisible with an enterprise cloud platform that delivers the agility and economics of the public cloud, without sacrificing the security and control of on-premises infrastructure.